White Clock With Word Time Flies PowerPoint Templates And PowerPoint Themes 1012-The above template displays a diagram of a white clock with word time flies. Use this template for presentations on time planning, time management, time schedules, business schedules. The ideas and plans are on your finger tips. 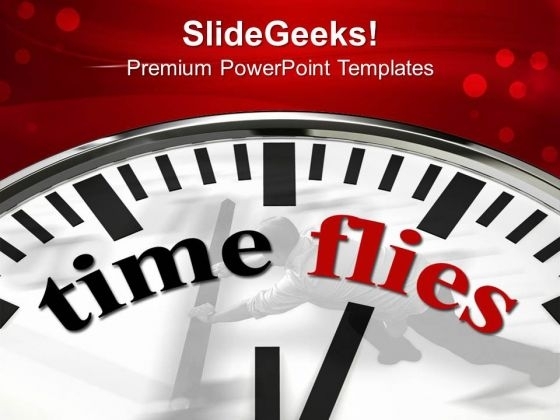 Now imprint them on the minds of your audience via our slides.-White Clock With Word Time Flies PowerPoint Templates And PowerPoint Themes 1012-This PowerPoint template can be used for presentations relating to-"Clock with time flies, business, success, communication, clocks, time planning" Begin your endeavour with our White Clock With Word Time Flies PowerPoint Templates And PowerPoint Themes 1012. You will never make a false start. Your thoughts and our White Clock With Word Time Flies PowerPoint Templates And PowerPoint Themes 1012 will get along famously. They will create an acclaimed team.